JUKI DDL5530 (Standard) & DDL5550 (Thread Trimmer) Lockstitch Machine - Replacement Parts High Speed, High Quality Flatbed Lockstitch Machine manufactured by the JUKI Corporation. Built in Japan. Superceded the DDL227 & DDL555 machines. Replaced by the DDL8500 & DDL8700 class machines. 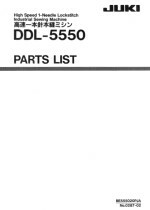 Need Parts for your JUKI DDL5530 or Juki DDL5550 Sewing Machine?